In this case commuters simply wanted a futuristic and modern railcar. 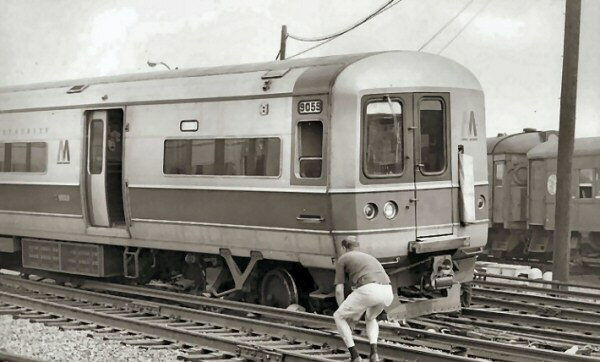 They didn't want a new railcar that had the look of something old. If people looked at that design they probably said, "Great, we have a new railcar to kick of the new millennium but it has a Flintstones look, and we don't want Flintstones, we want Jetsons." The M7 has a different shape obviously, and the railcar has the look of 21st-century train. If you think about it, the M7/M9's are more aerodynamic and have that Jetsons look, the look of 2001: A Space Odyssey (the car went into service in October 2002). Seems to me the M-1 thru M-6 was more aerodynamic with its rounded end. no matter how streamlined you make front end, each opening between cars creates about as much drag as parachute. The Metropolitan design reeked of 1960s by 2000, the front design may have aged well but it's not timeless. I'm curious as to why they never designed the M-1 through M-9 with diaphragms on the cab ends of the cars. Considering that the C-3 cab cars have diaphragms and the amount of between car traffic you would think they would have them on the MU's. people are not supposed to move from car to car , only within a pair as both cars have all a passenger needs . you want diaphragms for those that can not comply with conductors instructions or announcements ? DutchRailnut wrote: people are not supposed to move from car to car , only within a pair as both cars have all a passenger needs . What about stations with short platforms where only the first few cars platform. People are instructed to move to those cars. they are also told at boarding and during ticket control , but most are dumb enough to wait till last minute . The M-1's were delivered with F-End safety chains (actually cables) and canvas shrouds that were stowed in a tall compartment with twist latches in the Fiberglas front on the side of the end door hinge. These provided safety for passengers walking between cars. After many of the shrouds were ripped off by inattentive yard crews drilling cars, they were replaced with immobile curved stainless grab irons. Replacement end caps were manufactured without the compartments and eventually few of the originals remained. The M-3's were delivered with the same vertical compartment and hatch but nothing was inside it. Dutch, the fact remains that as per crew instructions over the PA, passengers are instructed to move between pairs to get to the right car to de-board. Therefore movement between pairs is officially permitted by the railroad and the question about diaphragms being needed was in order. Head-end View wrote: Seems to me the M-1 thru M-6 was more aerodynamic with its rounded end. A Sundberg-Ferar design, selected by MTA to design the "modified" R40 and R42s, also did BART and CTA cars.